Photo courtesy of Noresa Nickels AJ Nickels and Braxton Tate will be moving on to the regional cross country meet in Tiffin next Saturday, Oct. 28. From the picture, you can tell that they are fans of one another. GALION — It was a busy day out at Amann’s Reservoir Park in Galion on Saturday, Oct. 21. The park served as the running grounds for the Northwest District’s cross country meet. Runners from Divisions II and III were participating with hopes of advancing to next Saturday’s regional meet. Attending next week’s regional meet at Hedges Boyer Park in Tiffin will be Braxton Tate and Airyona Nickels. Tate will be moving on after a sixth-place finish in the boys race on Saturday afternoon, with a finishing time of 16:22.62. AJ Nickels made the cut for advancement, claiming a 16th overall finish in a time of 21:06.95 on the girls side of the event. In both the boys and girls segments of the competition, the top four teams and the top 16 individuals would qualify for regionals. Overall on the day, the Lady Tigers finished eighth in the 12-team field. Lexington claimed the district crown over runner-up Ontario; 34-82. Abby Lesniak, a freshman from Milan Edison was the individual champion with a time of 19:20.67. Rounding out the girls team placements were: 3. Milan Edison; 4. Bellevue; 5. Willard; 6. Upper Sandusky; 7. Shelby; 9. Vermilion; 10. Perkins; 11. Oak Harbor and 12. Port Clinton. There were 83 total runners finishing the Division II race. Other Lady Tigers in action on Saturday were: Sari Conner (41st)- 22:55.97; Murissa Windbigler (48th)- 23:17.76; Teresa House (55th)- 23:45.49; Ashlie Sallee (77th)- 26:17.59 and Cheyenne Blair (78th)- 26:17.77. Galion’s boys squad took home 10th overall in the 16-team field in their portion of Saturday’s event. The boys from Shelby shocked the boys from Lexington for the championship; 46-53. Ryan Johnston, a senior from Lexington, won the race with a time of 15:30.05. Rounding out the boys team placements were: 3. Milan Edison; 4. Huron; 5. Perkins; 6. Willard; 7. Ontario; 8. Bellevue; 9. Oak Harbor; 11. Bucyrus; 12. Upper Sandusky; 13. Port Clinton; 14. Vermilion; 15. Fostoria and 16. Clear Fork. There were 111 total runners finishing the Division II race. Other Galion runners in action on Saturday were: Brenden Ganshorn (42nd)- 18:19.38; Nate Eckert (54th)- 18:44.57; Spencer Guinther (76th)- 19:26.71; Luke Eisnaugle (87th)- 19:56.37; Simon Shawk (89th)- 20:05.19 and Weston Rose (98th)- 21:10.14. Congratulations on a great season Tigers and good luck to Braxton and AJ on Saturday! 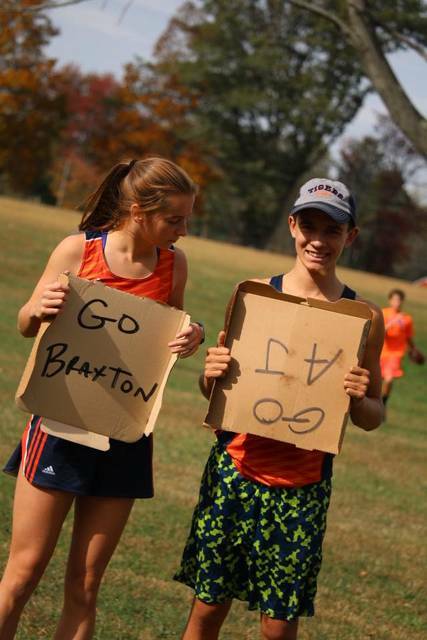 https://www.galioninquirer.com/wp-content/uploads/sites/38/2017/10/web1_Airyona-and-Braxton.jpgPhoto courtesy of Noresa Nickels AJ Nickels and Braxton Tate will be moving on to the regional cross country meet in Tiffin next Saturday, Oct. 28. From the picture, you can tell that they are fans of one another.